The second vessel of the advanced Soryu-class submarines and received the building number 8117, as a part of the mega-project S131. She was laid out on 31st March 2006, and launched on 15 October 2008. She received the name of Unryu, which means Cloud Dragon in Japanese. The SS-502 was finally commissioned on 25th March 2010 and she belongs to the operative port of Kure. 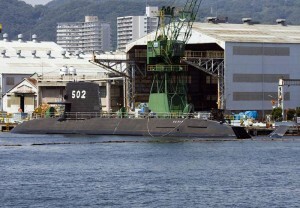 The SS-502 Unryu submarine at the Kawasaki Heavy Industries yard in Kobe .